Sandy and Angela Baldanza at their New Canaan restaurant on Sept. 7. 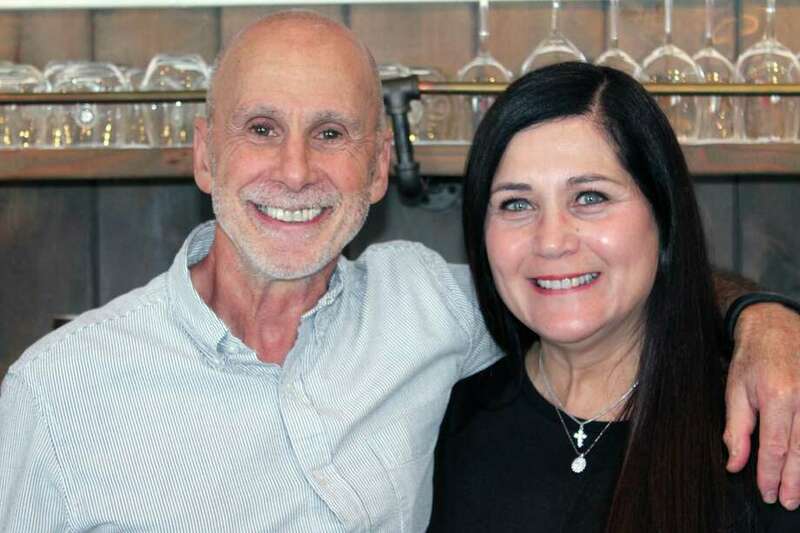 NEW CANAAN — Sandy and Angela Baldanza took an unusual path to restaurant ownership. The husband and wife team have more than 40 and 30 years, respectively, in the fashion industry under their belts. Together, they launched multiple clothing brands and, four years ago, decided to try their luck in the restaurant industry and opened Baldanza Cafe off of Elm Street. Both born to Italian families and from nearby Purchase, N.Y., the both Sandy and Angela grew up in households in which food and family were valued. That tradition continues. They have three children, one of whom works with them at the cafe. The Baldanzas have also immersed themselves in the community, remaining dedicated to sourcing their food locally from farms in Connecticut and New York and emphasizing charity. On Sept. 27, the cafe will host a benefit and album release for Nick Depuy, whose mother, Ann, is battling Lou Gehrig’s Disease. For more information or tickets to Nick Depuy’s album release at Baldanza Cafe, some of the proceeds from which will help to cover the everyday care for Nick’s mother, Ann, visit https://www.eventbrite.com/e/nick-depuy-album-release-dinner-tickets-36440131414?aff=eprofsaved or visit https://www.gofundme.com/weloveann. Q: How did you guys go from the fashion industry to the world of owning restaurants? S: Even while we were in the fashion business, the most important thing in our lives was food. When I sold my apparel business, Angela went on to work for Jones Apparel Group and I wasn't ready to retire. The game plan was actually to go into the wholesale soup business. We started testing it and I was making some soups at home and distributing them to a few little places. And they did well. We felt there was a real parallel between clothing and food, as far as distribution in a wholesale business. So we felt that transition, with our knowledge of food, not from a professional level, but from a personal level, and the background we have in the apparel business would give a foundation. We were prepared. Q: Why did you decide to open an organic restaurant? A: I think we were focused on it being clean food, locally sourced, non-GMO. Because that's where you get the best flavors. And in a lot of cases, too, we may not have certified organic, but we know the farm, so we know where it’s coming from and that it’s clean. S: We embraced this philosophy and we felt a lot of other people would also embrace it. And I think we were right in that respect. A: I think we were ahead of the game. This goes back over four years now. I also believe that we wanted to have that sense of community where we bought local, we hired local people. We were able to grow something within the community and also give back. Q: In what ways have you given back to the community? A: We’ve gotten involved with local charities like Filling in the Blanks, for local children that don’t have the means to eat on the weekends. We were able to raise $5,000 at a cocktail party, which was amazing. We also do dinners with local authors. And we’re doing a dinner for local musician Nick Depuy, whose mom is a local and very ill with ALS (Lou Gehrig’s Disease). We’re hosting a dinner here the night he’s going to be launching his album. Q: Why did you decide to open Baldanza’s in New Canaan? S: We’re from Pound Ridge. One day, we were going for breakfast at Rosie’s. We were walking down the street and I looked down the alley here and saw it was empty. We were thinking about the wholesale soup shop and I wanted to find a showroom. I ran across the street to the realtors and said, ‘I want that space, and if you can get me a great deal I’ll close in two weeks.’ And we did, we closed in two weeks. Q: Your new Baldanza Fresco line features soups that have been hyperbarically sealed. What is hyperbaric processing and why did you decide to package your soups that way? A: They will be cold soups in the refrigerator section. We really didn’t want to be on the shelf amongst a million other people in competition, plus we wanted to keep that fresh factor. Once you heat a soup and put it into a jar it changes the flavor. S: We use water pressure to preserve and maintain the integrity of our soup. The greatest part about it is it does not require any additives. We had to have this special container made that can go into this chamber and our soups are put at 78,000 psi water pressure. It kills every bacteria known to man. The day that that soup goes on sale, it’s about as clean as anything can possibly be. A: We can get anywhere from 60- to 90-day shelf life in the refrigerator with it. We’re going to start with a butternut squash, lentil and turkey chili, and then expand to beef chili, chicken noodle soup and pasta fagioli. And we’ll be at Walter Stewarts and eventually Whole Foods in Darien.